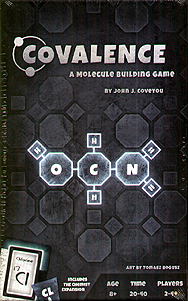 Covalence is a chemistry themed, puzzle style, cooprative game where all players work together, attempting to build a number of secret organic molecules. One player takes on the role of the "Knower", who may look at the Secret Molecules, while all other players are the "Builders". The Knower gibes each Builder clues that relate to their specific Molecule, and the Builders interpret these Clues as they arrange and rearrange their Element Tiles, attempting to deduce the structure of their Secret Molecules before the allotted clues run out!